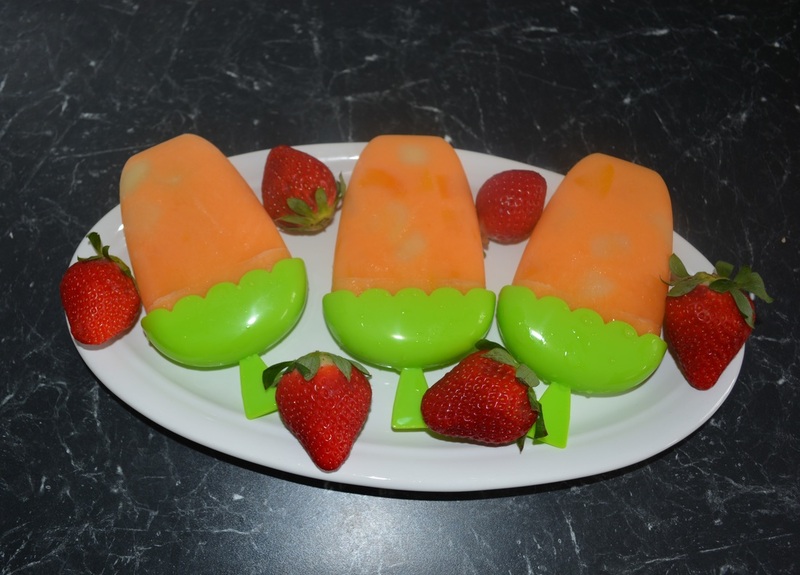 These Ice Pops are fabulous, they are delicious and they look great. I have a lot of ice pop moulds in my cupboard, all shapes and sizes as my kids really like them. So when I came across this recipe in one of my many boxes of recipe clippings, I thought my kids would like it, so I made it. They truly were delicious. The ice cream part of it is quite soft, and my kids love the fruit. They have a nice tangy flavour, and they look great. I make many a many different flavoured ice pop and in all honesty this is the favourite with my kids. When these are made, they go very quickly. I double the recipe now, there is no point only making one batch, they are always eaten. Next I am going to try the same recipe but changing it so that the jelly and the yoghurt is a berry flavour, that is a tip I got from the original recipe. I'm sorry I can't remember the name of the magazine, so I cannot give it credit, as I like to tell you where I get recipes from, it's only fair. Now finding mango yoghurt can be difficult, I use peach and mango instead, if that is all that I can find. If you want you can use lite jelly crystals and reduced fat yoghurt, that is up to you. Also you can omit the strawberries when not in season and use canned pineapple instead. Now the recipe makes 8 x 200ml ice pops. If your moulds are smaller you will get more ice pops. 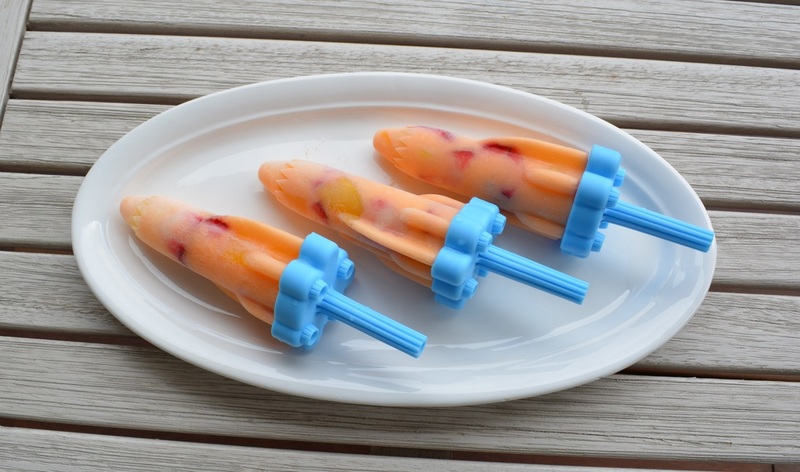 Now if you are not like me and don't have many a many ice pop moulds, you can use small disposable plastic cups instead. Just place them in a baking tin so they sit flat when you put them in the freezer. Another tip I picked up is you cover each cup with plastic wrap, make a small slit in the centre, that is where you slide in your wooden popsicle stick, the cling film will keep it in place. Popsicle sticks can be purchased in supermarkets, fabric or craft stores. So here is my new recipe, give it a try and let me know if you liked it as much as we do. Place the jelly crystals into a large heatproof jug. Add 1/2 cup of boiling water, stir until the jelly has dissolved. Add the mango and banana nectar, whisk to combine. Add the yoghurt, whisk to combine. Stir in the two fruits, including the syrup, then stir in the strawberries. Now using a slotted spoon, divide the fruit amongst your moulds. Pour the jelly mixture over the fruit. If using moulds with sticks in the lid, place the lid on and freeze. If using plastic disposable cups, read my tip above about inserting your wooden popsicle stick. Freeze for 8 hours or overnight is best. To unmould simply dip it into a cup of hot water briefly to loosen it enough for it to come out. Serve immediately.